NYT asks: do tax cuts lead to economic growth? Why not? The main economic argument for tax cuts is simple enough. In the short term, they put money in people’s pockets. Longer term, people will presumably work harder if they keep more of the next dollar they earn. They will work more hours or expand their small business. This argument dominates the political debate. If that is so, why not follow-up with some data that allows the reader to verify the truth of that argument? 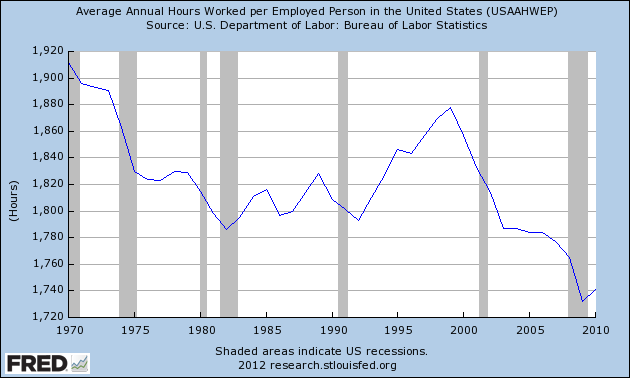 So, Reagan and Clinton raised taxes and oversaw increases in annual hours worked per person employed in the US. George W. Bush started cutting taxes in the 2000s, which is a policy that Obama did not reverse. So, the data says that people worked less, and not more since George W. Bush cut taxes. One should not forget that those tax cuts went mostly to the rich and that inequality increased during that time. Most working middle class Americans saw their real wages fall during that period, which would mean that they should or could have worked more, and not less. A quick glance at some facts leaves the non-economist with the impression that less taxes cause economic growth as a statement is false. The NY Times had the opportunity to bring some more light into the debate but missed it. Are news media not supposed to confront readers with statistics twice in one article? There should be tax cuts for those who comparatively earn less than those who make much more otherwise there will be more wall street movements. Save the poor but burden the rich.